The head of Nigeria's oil industry regulator has been suspended pending an investigation into oil licences awarded last year under a former president. Tony Chukwueke will take forced leave while the government investigates a licensing round which he oversaw. Former President Olusegun Obasanjo sold lucrative oil rights before departing, prompting accusations that he was awarding political sponsors. 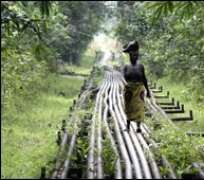 Nigeria is Africa's second-largest oil producer, surpassed only by Angola. "The federal government has asked the director, department of petroleum resources, Mr Tony Chukwueke, to proceed on leave pending the completion of an in-depth audit relating to the 2007 oil prospecting bid round," said the oil ministry. But the ministry highlighted that its decision was not due to "specific findings of impropriety" by Mr Chukwueke. The investigation relates to an auction held in May 2007, a fortnight before Mr Obasanjo departed. Despite attempts by Mr Obasanjo's government to attract multinationals by offering them preferential bidding on certain lucrative blocks, many shied away from bidding, fearing a new government would overturn any deals. Nigeria's current President, Umaru Yar'Adua, came to power pledging to rid Nigeria of decades of corrupt practices. The investigation into the May 2007 auction will be watched closely and Nigerians will view it as a measure of Mr Yar'Adua's desire to rid the country of corruption, observers say. "The sums of money in oil and gas contracts absolutely dwarf whatever dodgy deals may have gone on in other sectors," said a Nigeria-based independent analyst, Anthony Goldman. "If you are serious about changing Nigeria, you would have to do it by tackling the oil and gas sector first," he said. It is not the first timer Mr Chukwueke has been embroiled in controversy. He was suspended in 2006 after awarding drilling rights to an unknown company which had not been involved in the open auction process. The company went on to sell the rights to the block for $35m (£17.9m). He was later reinstated without explanation.